Citation Information: J Clin Invest. 2006;116(5):1292-1301. https://doi.org/10.1172/JCI26971. Factors that determine the spectrum of target organs involved in autoimmune destruction are poorly understood. Although loss of function of autoimmune regulator (AIRE) in thymic epithelial cells is responsible for autoimmunity, the pathogenic roles of AIRE in regulating target-organ specificity remain elusive. In order to gain insight into this issue, we have established NOD mice, an animal model of type 1 diabetes caused by autoimmune attack against β cell islets, in which Aire has been abrogated. Remarkably, acinar cells rather than β cell islets were the major targets of autoimmune destruction in Aire-deficient NOD mice, and this alteration of intra-pancreatic target-organ specificity was associated with production of autoantibody against pancreas-specific protein disulfide isomerase (PDIp), an antigen expressed predominantly by acinar cells. Consistent with this pathological change, the animals were resistant to the development of diabetes. The results suggest that Aire not only is critical for the control of self-tolerance but is also a strong modifier of target-organ specificity through regulation of T cell repertoire diversification. We also demonstrated that transcriptional expression of PDIp was retained in the Aire-deficient NOD thymus, further supporting the concept that Aire may regulate the survival of autoreactive T cells beyond transcriptional control of self-protein expression in the thymus. Growth abnormalities and pancreatic atrophy in Aire-deficient NOD mice. (A) Body weights of individual female (circles) and male (squares) Aire-sufficient (open symbols) and Aire-deficient (filled symbols) mice after birth were plotted. Measurement for many Aire-deficient NOD mice was terminated around 15–17 weeks after birth because of their lethal phenotypes. 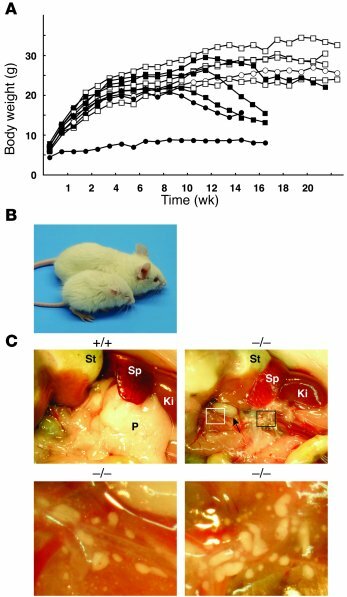 (B) Growth retardation of Aire-deficient NOD mice. Littermates of 7-week-old males are shown. (C) Pancreatic mass was absent from many Aire-deficient NOD mice upon gross inspection. Instead, many small white patches were scattered throughout the thin and lucent adipose tissues. The square areas marked with white and black lines are enlarged and shown in the bottom left and bottom right panels, respectively. An arrow (in the top right panel) indicates an enlarged pancreatic lymph node. Original magnification, ×1.2. Ki, kidney; P, pancreas; Sp, spleen; St, stomach.